Thompson argues that modern readers have tended to overlook the literary character of the biblical stories and traditions, and the fact that Israel in these stories is a theological (not historical) construct or metaphor. The same misreading applies to the New Testament, too. This post addresses the second part of Thompson’s argument, the evidence from Josephus and to a lesser extent from Philo. In his next chapter (12.2.1-3) Josephus presents a tradition that the Egyptian ruler, Ptolemy Philadelphus, had set free 120,000 people who had once been deported from Jerusalem to be enslaved in Egypt. What was the origin of this etiological tale of “Jews” having been deported from Jerusalem? Was it not based on Josephus’ understanding of “Jew”? Josephus uses the word “Jew” to describe those people in Egypt who had certain religious affiliations. He did not define them in terms of geography or origins but in terms of religious affiliation. And what of the Persian name for the province, Jehud? The old name of Judea had referred to the highland region to the south of Jerusalem. Thompson suggests the Persian name of Yehud to refer, rather, to the province of Jerusalem may be related to the same religious association. So in the above we see that Josephus implicitly associates the Samaritans with the diaspora Jerusalemites. Later, however, Josephus polemicizes against the Samaritans and attempts to define them as non-Jews. Yet his polemic acknowledges that the Samaritans had identified themselves as Jews, following the same laws of sabbath observance and such. Josephus despises the Samaritans and so presents them as now denying that they are Jews. In attempting to refute the Samaritans’ claim to be Jews as a lie, he argues that they were in fact Sidonians — but then in the same context claims they were Medes and Persians. He even accuses them of demonstrating their “non-Jewishness” by having their temple renamed in honour of the Greek god Jupiter. But earlier, Josephus himself had spoken positively of identifying the Jewish god with Jupiter. Now when Alexander was dead, the government was parted among his successors, but the temple upon Mount Gerizzim remained. And if any one were accused by those of Jerusalem of having eaten things common or of having broken the sabbath, or of any other crime of the like nature, he fled away to the Shechemites, and said that he was accused unjustly. So one having been accused of violating the Jewish laws fled to the Samaritans and claimed he was accused unjustly — thus implying that the Samaritans were themselves observing the same traditions. he refers to Jews having been carried captive beyond the Euphrates. as well as in Cyrene and Cyprus. He describes Jews as controlling Cleopatra’s army (Ant. 13.10.4 and 14.7.2). Their great power in Egypt he explains by their having been themselves originally Egyptian. He writes in connection with a revolt in Cyrene, of ‘our people, of whom the habitable earth is full’, and of Jews in every city. ‘It is hard,’ he writes, ‘to find a place . . . that has not admitted this tribe of men and is not possessed by them’. He also speaks of the Jews of the diaspora much in the manner of Philo: model citizens of the empire. What Josephus is doing is describing Judaism as being made up of “all who believe in the almighty God.” This is what underlies his understanding of “Jew”. Josephus tended to consider all those among the growing adherents to monotheism as Jews. Not so Philo. Philo, the Jew of Alexandria, identified himself as a Greek (“we Greeks”) when comparing his standing with ‘Barbarians’, the Orientalists. But when seeing himself as distinct from fellow Egyptians he did call himself a Jew (“we Jews”). Philo’s understanding of “Jew” stands completely in accord with the theological meaning found in the Bible’s theology of “the way”. As does the Bible, Philo pits the way of the godly, those who are dedicated to observance of the torah, against the way of the ungodly. The biblical concept of ‘new Israel’ refers to the living generation who are expected to learn the lesson of the literary old Israel. (Compare Paul himself calling on his readers to learn from the failings of Israel of old.) The old Israel is always the theological failure and instructor of the new. Historians would have to ignore the many other communities and that were associated with Yahweh temples and cults. This problem might be solved by the “many Judaisms” approach, but that leaves unresolved the problem of rabbinical Judaism. Rabbinic Judaism of the second century can hardly be explained as the heir to any such temple Judaism. It was at that time that the role of the temple, as expressing the divine presence on earth, was recast in the form of the metaphor of a future and heavenly Jerusalem. This was not the rabbi’s torah Judaism. Rabbinic Judaism focussed on “the spiritual heart of the tradition” and can hardly be said to be heir to a temple tradition. Has the hypothesis of ‘multiple Judaisms’ had its day? Scholarship has focussed on the presumed historicity of the written traditions and proposed that there were “multiple historical Judaisms” to explain the diversity of these. But each of these Judaisms are essentially “literary Judaisms”. Their self-identities have been defined by the tradition. I am restraining myself from commentary here. There is a lot being said that needs to sink in and really register before discussion begins. What is behind the multiple variants of this literature? Regional differences and chronology have no doubt had some influence but they are not the primary reasons for their variations. What makes them both a collective and a multiplicity of views? This returns us to the central theme running through them all. 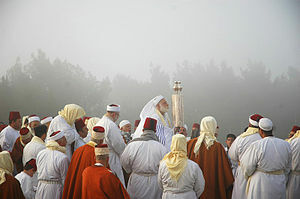 It is a theological theme: “Old Israel” is a metaphor and an exemplar for the benefit, the contemplation, of the people of God in the here and now, those who identify themselves as the “new Israel”, the people of the “new Jerusalem”, those who have chosen the way of the Lord and turned their backs on the way of the ungodly. The literature consists of multiple ways of perceiving this theological theme or single religious idea. So what do we do with the various “historical Judaisms”? Thompson is saying the communities behind this varied literary corpus are defined by their intellectual outlook and not any historical ethnicity. Here we find the many West Semites of Egyptian military colonies such as that of Elephantine and Herontopolis. And let’s not forget those well-known assemblies of people who eschewed the distinction between Jew and Gentile yet at the same time identified themselves as a “new Israel” and related concepts. In all of the above we find “priests and official cult functionaries of the various Yahweh temples”, and even supporters of the temples and who yet belonged to a variety of religious and philosophical associations. They wrote in Greek, Aramaic and Hebrew. the many anonymous and often pseudonymous works of the Tanakh; the Apocrypha, Pseudepigrapha, the Dead Sea scrolls, the gospels and epistles, as well as the works of such authors as Josephus, Philo of Alexandria and Philo of Byblos. For such people, the terms ‘Jew’, ‘Jewish’, and ‘Judaism’ are historically highly equivocal. more as an intellectual and philosophical movement within Hellenism itself. Consider the “Jewish” temples of Jerusalem, Samaria, Elephantine, Leontopolis and Beersheva. Are these testimony to religious coherence or to religious and political factionalism and special interests? We know, for example, that many of the early “Jewish” texts such as the sectarian Dead Sea Scrolls “do not see the temple as the core of their religion, though they recognize its political and cultic value.” Recall in the previous post the evidence that for the community at Elephantine there was no clear religious primacy for either the Jerusalem or the Samaritan temple. If the Jerusalem temple really were the central idea of Jewish religious affiliation, then the Samaritans would have been excluded by definition, as well as other ethnic and geographic centres of Judea itself. Note, also, the relationship of Idumean power and its relationship with the Jerusalem temple at the time of Herod. Consider also the various groups of the Galileans. Where did all the Jews come from? And who owns the Bible historically? Judaism lays claim to the Bible. Christianity lays claim to the New Testament and the Septuagint. They both make this claim out of theological necessity. Both assert a linear, chronological or historical continuity with those books, but that assertion is a religious necessity, ideologically motivated. After Rome destroyed Jerusalem in 70 CE, and again in 135 CE, the people of the region “picked up their lives and continued” on. Under the Byzantine period Palestine became Christian and still there was no large deportation. What came to an end was not the indigenous population of the land. [W]hat ended was Jerusalem’s and its people’s self-understanding as Jewish. In the fourth century Monophysites, and in the seventh century the Muslim religion ruled the region. Though many churches became mosques, the indigenous population continued with a transformed understanding of itself and its religion. Posted on 2012-02-28 08:29:03 GMT+0000 by Neil Godfrey. 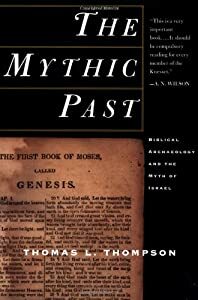 This entry was posted in Uncategorized and tagged Bible, Israel, Jerusalem, Jew, Josephus, Judaism, Philo, Samaritan, Thomas L. Thompson, Thompson: The Mythic Past. Bookmark the permalink. a long time lurker here till now. I must say this opens up a can of worms. This brings to mind a book by Raphael Patai, The Myth of the Jewish Race. Also, two books by Paul Wexler, The Ashkenazic Jews: A Slavo-Turkic People in search of a Jewish Identity and The Non-Jewish Origins of the Sephardic Jews. Wexler speaks of “Palestinian Jews” in his books but that term becomes questionable too if one takes into an acount what is written here. So in a nutshell there never has been Jews as an ethnic group from the beginning till now. I personally think the Sephardic Jews are Barbar-Christians in North Africa who converted to Judaism (after reading Wexler) much like Falashas, the Ethiophian Jews. And also if what is written here is true then one understands why even in Palestine, Jews stop speaking Hebrew and begin to speak (a form) of Aramaic. Ethnicity or race is surely a cultural identity anyway. I read I am as likely to have more in common genetically with a native born Chinese or African as a fellow white Australian as not. We look at the changes in “racial” occupations of the British Isles prior to the Norman conquest and it is quickly seen that there can be no such biological entity as one who is distinctly “Scot” etc, for example. This applies just as much to the peoples of the ancient Levant. It’s a fascinating question. But I deplore the ignorant and bigoted response Thompson has received among many academic in the U.S. for his work. This is comparable to any ideological suppression of genuine scholarship that does not serve the prevaling party interest. Although frequently updated on evidence concerning African Arabian First Temple Israelites, Professor Thompson, whose admirable work has shown that OT archaeology has not confirmed the Biblical narrative, cannot (like all other minimalist) overcome suspected racial prejudice to consider that the Arabs and Ethiopians may have a point when suggesting the OT narrative is true but occurred in West Arabia until 586 BCE. Ethiopia has the oldest inscriptions mentioning Hebrew as well as reference to three queens of Sheba (Adi Kaweh ca.800 BCE) and the Queen of Sheba’s Torah in Ethiopia is much older than the official one, besides being shorter, simpler and kinder. Rabin’s 1951 work on Ancient West Arabian confirmed Salibi’s locating the Hebrew in West Arabia and the description of the theft of the Ark and its passage to Ethiopia only make sense if it was stolen from a Jerusalem in Asir. Minimalists may think that maximalists are obdurate, but the Arabian Judah School thinks minimalists are bigoted. The evidence from Arabia and Ethiopia suggests there was a First Temple Israelite community that did not share the Babylonian exile and continued a separate existence until “discovered” by Second Temple Jews in recent times. Why should Thompson’s reluctance to accept the Queen of Sheba thesis be attributed to racism any more than his rejection of the Davidic kingdom of the Bible be attributed to anti-semitism? Readable in gray color beneath the “Download”. Any scholar who wants to speak or write any thing on ancient Israel should read literature on ancient India and its puranic literature. Present Israel has nothing to do with its ancient counterpart except that it s a new settlement after the Flood. I wasn’t aware there was a flood in Palestine prior to Israel’s settlement in the early or mid twentieth century. Floods must be pretty rare, there, yes?